“When we speak of magic, we should speak of those moments that were the purest. When the stars were bright and when the laughter was loud. “This was our first trip away from our two children ages 4 and 9 months. We were celebrating my wife Jill’s 40th birthday, our six year wedding anniversary and my good health, as three years earlier, I battled bilateral breast cancer. It was an understatement, to say the least, that I appreciated every single moment of our vacation (as I now appreciate every day with a new perspective) and our alone time together. “We had a small city hall wedding, so we’ve taken advantage of having professional photos taken when we go on vacation and our anniversary trip was one not to be missed. We took the vacation over our Thanksgiving holiday and traveled across Ireland, with our last stop in Dublin. After getting the hang of driving on the opposite side of the road, the trip was truly breathtaking. We couldn’t stop taking photos and stopping the car to take in all the natural beauty of Ireland. Our favorite memory was driving along the Slea Head route in the Dingle Peninsula. “We had always wanted to go to Italy together and this summer felt like the perfect opportunity. We were both swamped at work and only managed to book our flights and accommodations two weeks before departure. 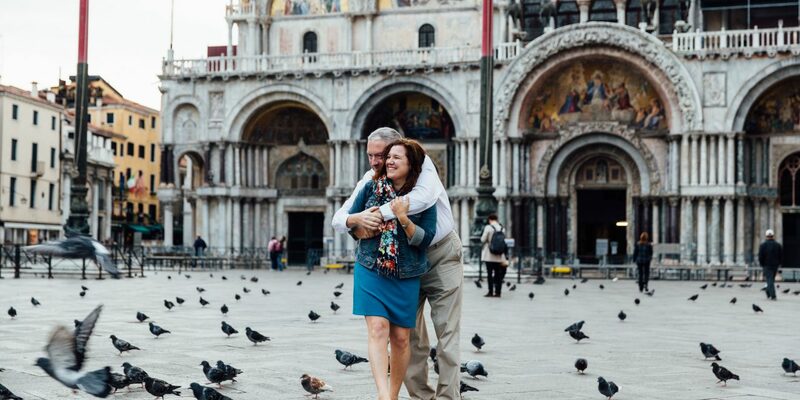 Once we did, I knew I wanted to propose in Italy and that’s when I found Flytographer!